We have FREE needs-based scholarship openings for both Middle and High school students. If you are interested please fill out our contact form. Running Start is a series of mentor-led workshops to give youth the entrepreneurial skills and tools they need to start a business. During each workshop, middle and high school aged youth will work on a business idea. Some students may come to the workshops with an idea in mind, while others may join a team. Subject matter experts will present the material in each workshop. Local entrepreneurs will also be on hand during the workshops to guide attendees. Students do not need to come to the program with a business idea in mind. Running Start has also developed a Business Planner Workbook with activities that will be completed during the workshops. Students will cover ideation (or company creation), testing their company idea, marketing it, and finally pitching it. 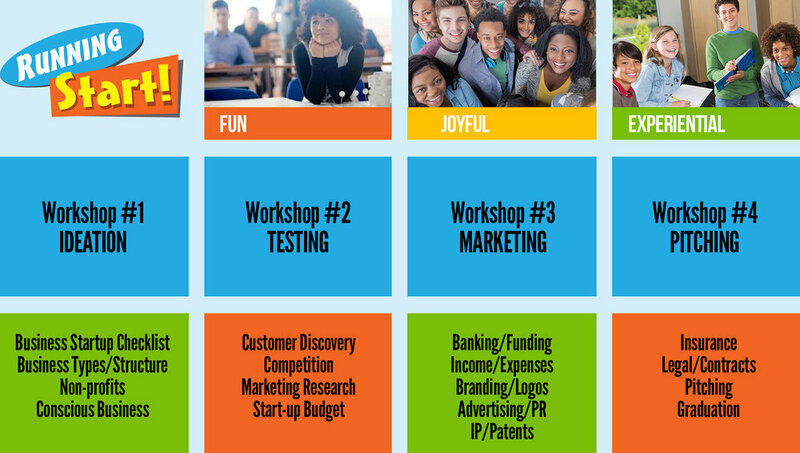 The workbook and workshops will cover business basics, company ideation, non-profits vs. for-profits, business planning, sales, market research, budgeting, branding, and more. Youth walk away with the workbook, which is the foundation for a business plan. They will also receive a certification of completion and the opportunity to network with our mentor team. At the final workshop representatives from local education organizations, colleges and universities will be on hand with information. For more information, contact us. Workshop presenters include Ann Arbor SPARK, NewFoundry, Inovo, Plante Moran, Renaissance Venture Capital Fund, Bidlack Creative Group, Ellanyze, Hylant, Bodman, Varnum Law, Wag Your Tail Doggie Treats, Zingerman's, Fancy Free Organizing, and many more. The current Running Start workshop program has begun. If you are interested in future sessions, please fill out our contact form and you will be put on a waiting list.